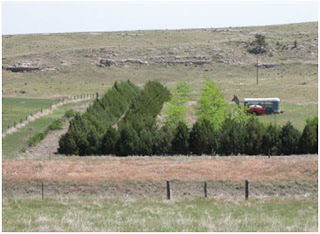 A possible cost share program for new windbreaks might be the continuous CRP Program. Continuous CRP sign-up requires land to currently be in cropland. Offers for continuous sign-up are not subject to competitive bidding, 90% cost-share is available for eligible land for field windbreaks, shelterbelts and living snow fences. Offers are accepted provided the land and producer meet certain eligibility requirements. For more information contact the FSA or NRCS office @ Hugo at 719-743-2408.